A fun little project this, that has happily wasted an hour this afternoon. 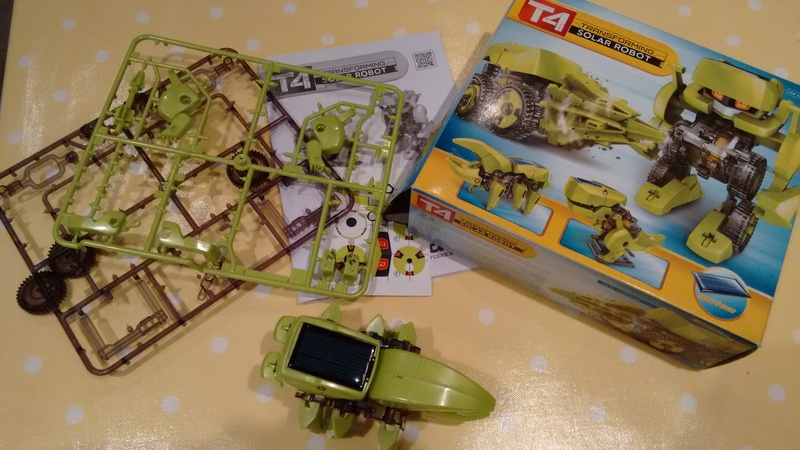 The kit is very nicely moulded and the instructions are very clear. Tamiya themselves would be proud. 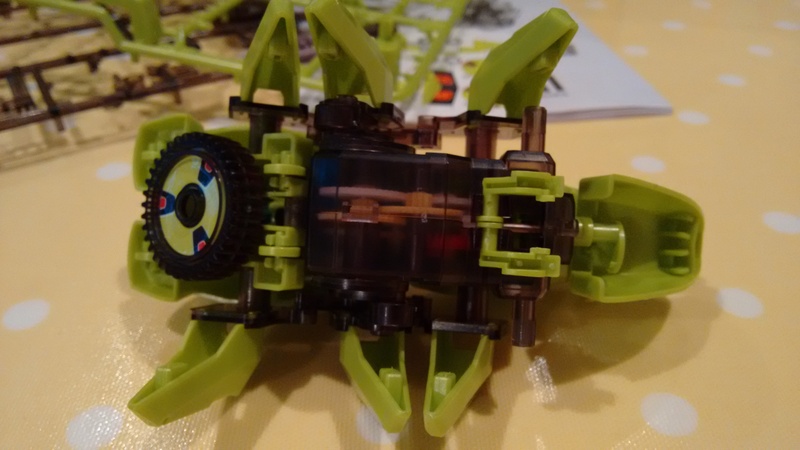 To say it is “transforming” is a bit misleading – there are actually four different models that can be built from the parts, you can’t transform from one thing to another like Optimus Prime. 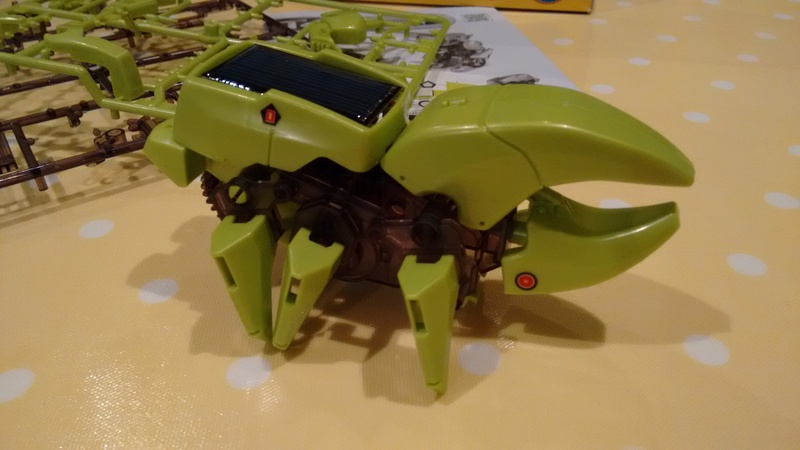 Me and my son went for the Rhino Beetle model. He cut out about four pieces before he got distracted, I had to do the rest. It helps that I have a very good pair of Tamiya flush cutters as there are lots of parts to be cut from the sprue and you need to be precise. The solar panel attaches to a tiny motor that drives a gearbox with a lot of reduction. It works, as you can see from the video – but it would need a lot of direct sunlight to run. The instructions suggest that it will run under a 50w halogen bulb, and it does – when it is a few inches away from it! 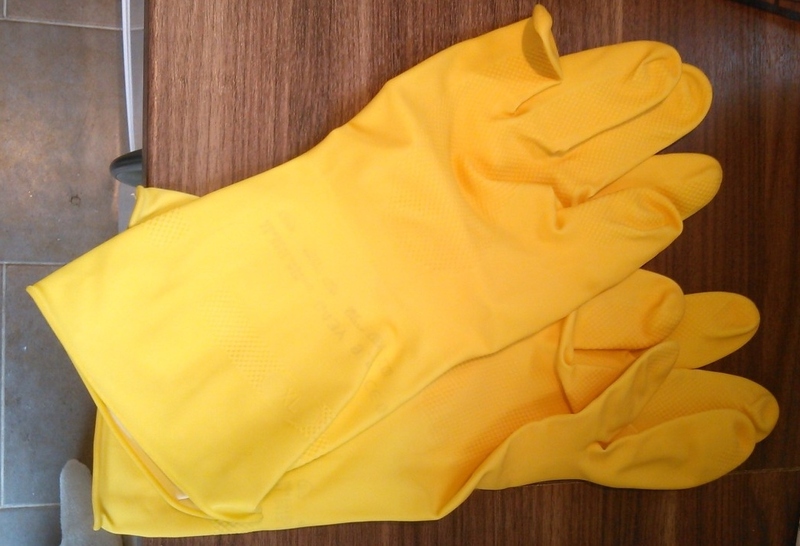 XL Marigolds… for doing the housework like a MAN! You won’t find these on the average supermarket shelf, but you can get them on eBay – classic yellow Marigold’s (G43Y) in a proper size for men (9.5). Most comfortable dishwashing gloves out there! Last a long time too because they aren’t being stretched out of shape. If you are going to spend some time at the sink – you’ve got to make sure you have the right gear. This is my watch. Supposedly waterproof to 200m. Didn’t survive a week in the swimming pool on holiday though – but that might be because I changed the battery myself and the seal may not have been as good as it was when it came out of the factory. 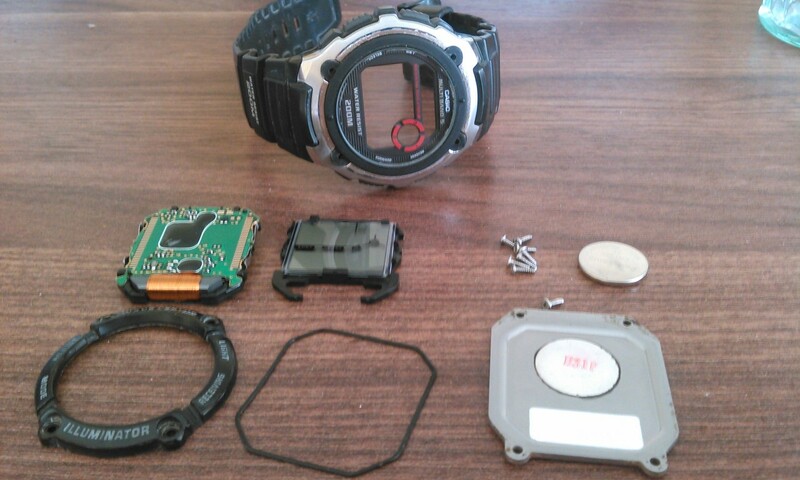 I can’t really say much about the internals, but as you can see the circuit board is separate from the screen; there is a rubber seal that goes around the back; and although the screen guard is removable, the watch face itself seems to be glued in place and can’t be removed (easily). I was also intrigued to find that the beeps are made by vibrating the metal back of the case – you can’t hear them when the watch is apart. The good news is that after a couple attempts at drying it out (in the end, I used a hot air gun on a low setting), the watch works again, although I think the battery suffered as it doesn’t like to illuminate very often. I’ve had a fair few troubles with the battery in this watch so it is no great surprise that it is being temperamental again! Perhaps this photo will be of use to someone? Small electric motor with reduction gearbox to turn it, exceptionally bright LED to illuminate it… End result, a starry night on the ceiling. This one is dead now, looks like no brushes left on the motor after 5 years! 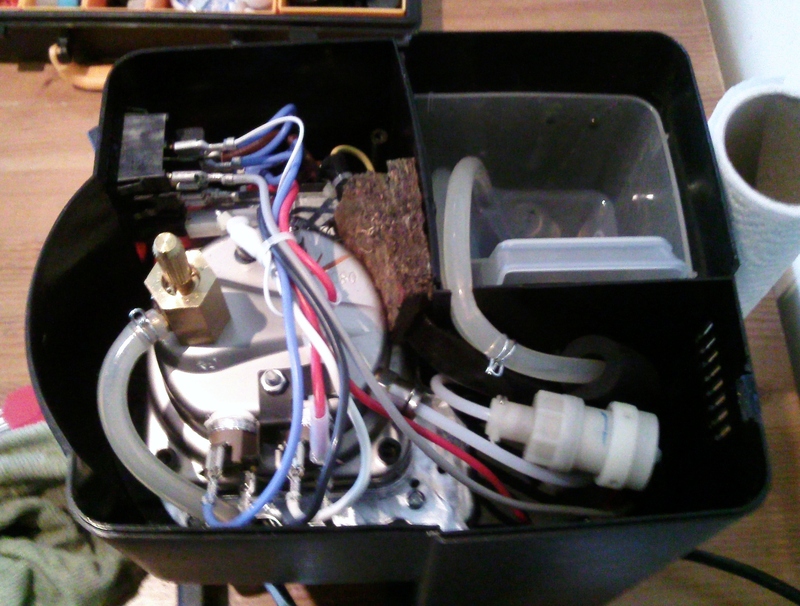 It’s really a lot simpler than I expected – a pump and a boiler. The pump (to the bottom right under the pipes) fills the boiler with water and (I suspect) the hot overflow goes down into the cup. Steam is released from the top of the boiler with a valve. And that’s it. 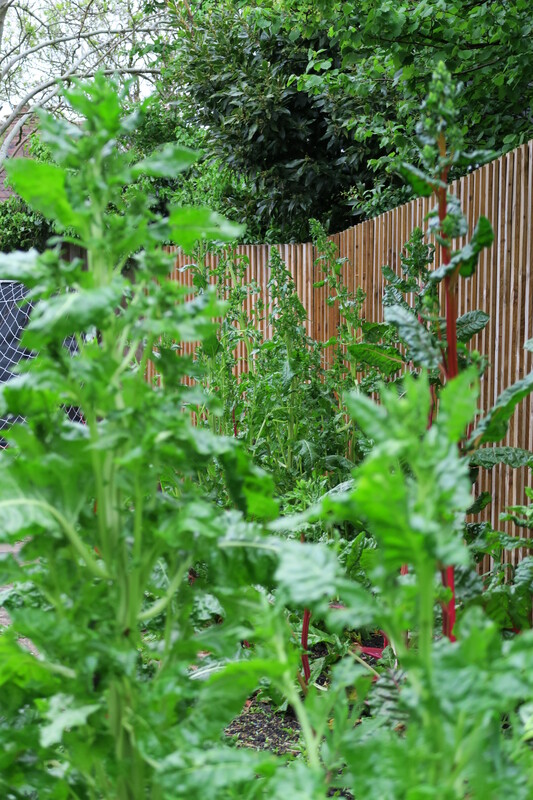 The water is directed through a mesh screen in an attempt to spread it more evenly. But even this simple machine creates the treasured “crema”. Getting it to this stage was pretty easy with the help of a T20 screwdriver, a Phillips screwdriver and a knife to help prise the decorative caps from the top. The steam knob prises off with a flat screwdriver, and there is a clip at the back holding the lid in place. I’ve resisted the temptation to take the boiler apart to clean it, I’m just running vinegary water through it instead. Seems to have made a difference to the water flow already! Marks & Spencer “Savile Row Inspired” suits. Proudly designed on Savile Row. Proudly made with British cloth. Actually manufactured in China.